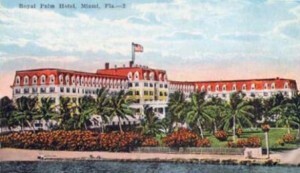 Postcard of Miami’s Royal Palm Hotel. 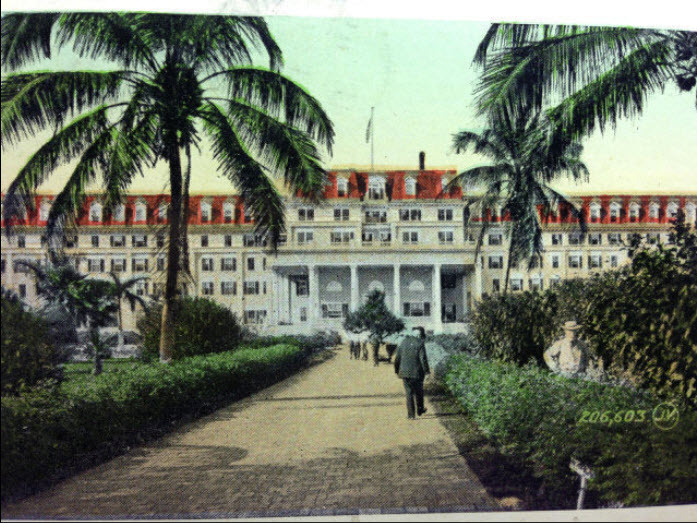 The Royal Palm Hotel was more than just another of Flagler’s grand hotels that dotted the east coast of Florida. Prior to the Florida East Coast Railway extending the railroad down to the north edge of the river, Miami was a sparsely populated frontier. It was estimated that there were only 30 people living in the area. The density of pine trees, mangroves and alligators outnumbered people. That all changed when a winter freeze and Julia Tuttle’s persistence helped convince Henry Flagler to extend the railroad south and to build a city to be named later. Ms. Tuttle provided Mr. Flagler a generous sum of land for which to realize her prophecy that a great southern city will arise from the frontier located on the shores of Biscayne Bay. By October 24, 1895, Henry Flagler, Julie Tuttle and Mary Brickell completed the business of officially changing title to land that would serve as the basis for the new city. It was at that time that Henry Flagler mobilized his men to engage in the dual effort of extending the railroad and building the Royal Palm. This new city would represent the southern terminus for the FEC Railway when the extension from West Palm Beach to the new city was completed. According to the agreement, Flagler would need to complete the extension of the railroad and the building of the hotel within 18 months of the agreement date. Given the amount of work and the time to complete it, Flagler dispatched John Sewell and a crew of 11 black workers to begin clearing the grounds for the hotel. The grounds had to be cleared by machete and hard labor. In addition to general clearing, Sewell’s workers had to level an Indian burial mound. It was believed that the remains found in the burial mound were consolidated into containers and placed in ground adjacent to the location of the hotel. The first shovel of earth was turned on either March 1st or March 15th in 1896, by Rev. A. Brown. Once the grounds were cleared and ready for construction, Joseph A. McDonald, Flagler’s chief builder, employed anywhere from 300 up to 700 men, over the course of the project, to work on the grand hotel. By the summer of 1896, the Royal Palm Hotel was beginning to take shape. In the meantime, the residents of this new place needed to make things official. A legal notice was posted in the July 10th, 1896, Miami Metropolis for all eligible parties to attend an assembly that would take place a little more than two weeks later. This assembly would occur in a room over a pool hall called “The Lobby”. On July 28th, 1896, 312 registered voters cast their vote to ensure that the new city of Miami was born. As the summer turned to fall in 1896, the activity of finishing the hotel also included a fury of activity around furnishing and preparing the hotel for opening. C.B. Knott, the general manager of the East Coast Hotel System, and W. Merrill, the manager of the Royal Palm, hired an additional 400 plus men and women for non-construction activity in preparation for the completion of the hotel. As the opening of the hotel got closer, it was estimated that there were more than 1,100 people engaged around the hotel property. The bulk of the construction and finishing activity of the hotel would be done prior to Christmas. Once it was completed, the Royal Palm would leave a memorable impression on city residents and tourists alike. It provided the modern conveniences of the time with the elegance and beauty found anywhere in the world at that time. The hotel’s allure was enhanced by the back drop of the beautiful Biscayne Bay. Considering that Flagler used the same architects that built the Royal Poinciana and the first two Breakers, James McGuire and Joseph McDonald, it was no coincidence that the Royal Palm was built in the same Colonial Revival style as the aforementioned hotels. The Royal Palm Hotel was a wood frame building that was five stories tall and almost 700 feet long, and had a red mansard roof. It was painted in “Flagler Yellow”, a staple of the chain of hotels that were built and managed as part of East Coast Hotel System. The hotel also included a lookout tower and platform a top the six-story center section. This allowed guests to view the Cape Florida Lighthouse to the east and the Everglades to the west. Perhaps one of the most distinctive features of the hotel was the 578-foot veranda that wrapped around the eastern end of the hotel. This veranda provided rocking chairs for those who chose to relax and enjoy a nice easterly breeze from the bay. The hotel had 350 guest rooms and could accommodate up to 400 – 600 guests. There were an additional 100 rooms for maids and servants. The hotel had electric lights, two electric elevators and 200 bathrooms. The hotel’s interior public space was equally impressive. The stately lounge and ball room, the great dining room and the palm room were all paneled in white wood. The long corridors and column entrances gave way to open air entrances to appreciate the beautiful landscaping. There were plenty of potted palms surrounding the wicker furnishings. The dining areas, reading room, parlors and services led off from the rotunda. The common areas of the hotel also included a writing room, complete with stationary, and a billiard room. The grounds of the hotel were equally impressive. It featured rare and native tropical plants. This included plenty of the hotel’s signature royal palms. The plantings were done by Henry Coppinger Sr., the city’s first horticulturist and landscaper. The grounds also provided hotel guests a clock-golf course to enjoy leisurely gamesmanship. On the northwestern edge of the property stood an impressive 40 by 150 feet long bay-water swimming pool. After the hotel closed at the end of season, the pool was kept open for local residents to enjoy during the hot summer. Adults would pay 25 cents and children would pay 15 cents. As the Hotel came closer to completion, it was obvious that its beauty and elegance would transform what was once a mostly isolated frontier. The Royal Palm’s aesthetics were only part of the reason it would generate so much excitement during the first few tourist seasons. Many locals would congregate at the hotel’s front entrance just to get a glimpse of the many notable visitors to this iconic destination. As Christmas of 1896 approached, the Royal Palm Hotel was nearing completion. It wasn’t scheduled to open until January of 1897. Although the building was not complete, it was ready to accommodate its first guest just in time for Christmas Eve. Col. John Jacob Astor checked in a few days prior to Christmas 1896, just prior to the official opening of the hotel. Col. Astor was friends with Henry Flagler and he wanted to be one of the first to see this new grand hotel. He checked in with his son, Vincent, who was only five years old. The hotel staff immediately went out to find a Christmas tree, a Dade County Pine, for the young Astor. Vincent Astor woke up on Christmas morning and proceeded downstairs in a sailor’s suit to see that Santa Claus was able to find him and place presents under the Dade County Pine Christmas Tree located in the lobby of the hotel. Although Christmas 1896 was a found memory for the Astor family and the hotel staff, it was just several years later, in 1912, that Col. John Astor lost his life as a result of the sinking of the Titanic. Vincent Astor lived to the age of 68 when he passed away in 1959 of a heart attack. Col. Astor was the first of many distinguished guests in the years following the opening of the Royal Palm Hotel. The hotel became a popular destination for the rich and famous. Some other notable guests included: Andrew Carnegie of Carnegie Steel, Andrew Mellon of the Mellon Bank at Pittsburgh, Cyrus H. K. Curtis, Asa G. Candler of Coca-Cola, JP Morgan, Edward F. Hutton of Wall Street, Atlanta Banker Uncle Billy Witham, Charlie Schwab of U.S. Steel, and Gerard Lambert of the Lambert Drug Company. Prior to World War I, Miami was frequently visited by wealthy industrialists who brought their yachts to Biscayne Bay for the winter. The owners came down by train, sometimes by special car, to live on their boats or take a suite of rooms at the luxurious Royal Palm Hotel. The Royal Palm was the newest attraction for those who benefited most from the spoils of the Gilded Age. Miami’s wealthy visitors expected relaxation and luxury. The Royal Palm provided that luxury in the most tropical of settings. However, the hotel’s magnetic attraction was more than just its innate beauty and distinguished visitors. 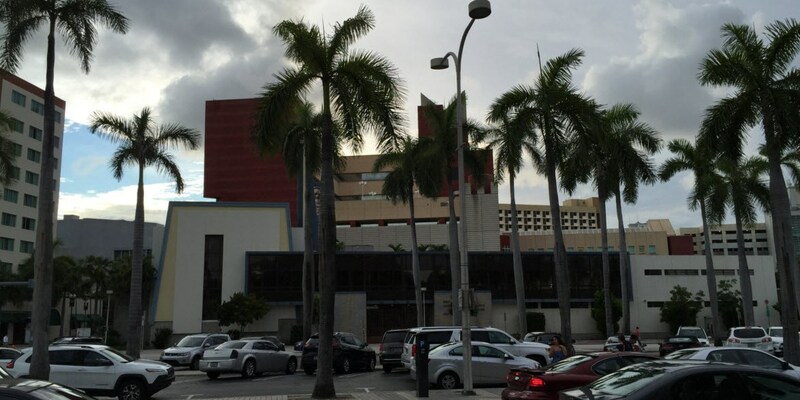 It became the very center of all social activity in Miami. In addition to a vast hotel, the grounds for the Royal Palm included a private park. Royal Palm Park offered a gathering place for recreational, religious and political gatherings. It was said that as many as 5,000 people attended the world’s largest Sunday school class. This class was held weekly at Royal Palm Park. The sessions were led by William Jennings Bryan, famous for his three-time bid to become president on the Democratic ticket. Henry Flagler was a deeply religious man who ensured that there was plenty of opportunity for worship on the grounds of his fine establishment. During the tourist season, Royal Palm Park also hosted afternoon band concerts, which was popular with hotel guests and Miami residents alike. The park maintained a baseball diamond for competitive leagues. It was not uncommon for crowds to gather for special ceremonies at the park. Overall, the Royal Palm operated as a complete self-contained resort. It offered excursions to attractions in surrounding areas, like the everglades, but also provided facilities for guest to engage in a variety of activities. Many just enjoyed being a part of the “rocking chair brigade”, who simply just enjoyed a nice breeze off the bay while relaxing on the veranda in one of the rocking chairs provided by the hotel. The hotel even played a role when Miami was transformed into Camp Miami during the Spanish American War in 1898. Henry Flagler was successful in convincing the U.S. Government to utilize this young city for a training camp for soldiers going to war in Cuba. On June 24, 1898, the first of 7,000 troops arrived in Miami. Because the Royal Palm was closed for the summer, it was utilized as the officer’s quarters and for the press. Royal Palm Park was used for daily drills by both the volunteer army, and then later by the troops that descended upon Camp Miami. Henry Flagler viewed the war as a way to expose more people to Miami and ultimately put it on the map. The Royal Palm was host to president elect Warren G. Harding. On February 1st 1921, just prior to his inauguration, Harding checked in and stayed at the hotel. Several other political dignitaries also signed the guest registrar for the same day, including: Senator Harry M. Daugherty of Columbus, Ohio and Albert B. Fall of New Mexico, along with several others. Although the president-elect claimed to be on vacation, many Miamians believed that cabinet positions were decided during this stay at the Royal Palm. Ultimately, Daugherty was named Attorney General and Fall was made Secretary of the Interior. Both men were central figures in the notorious Teapot Dome Oil Scandal. Daugherty was acquitted, but Fall was sent to prison and died shortly after his release in 1944. Although the Royal Palm was the center attraction in Miami since its opening, it didn’t take long for its fate to change course. After only 30 years of existence, a number of factors changed its standing as Miami’s centerpiece. Since the very first tourist season began in 1897, it was often said that the city of Miami came alive during the opening of the Royal Palm Hotel and died when it closed at the end of the season. The hotel opened in early January and closed shortly after Easter. As the city grew, there were certainly other newer and more modern hostelries for the northern tourists to consider when visiting Miami. Time certainly changed the allure of the Royal Palm. However, it wasn’t until September 17, 1926, that Miamians learned how vulnerable this building was to the winds of change. The 1926 Hurricane not only damaged the prospects of the upcoming tourist season, but it delivered what would be the first blow to Miami’s beloved icon. The Royal Palm was badly damaged during a storm that reached wind speeds of over 128 miles per hour. It was so badly damaged by the storm that it only opened briefly again in 1928. The hotel was never the same after this storm. The Royal Palm was given its second major blow when its manager of 22 years passed away. Joseph P. Greaves became a very prominent and important part of the running of the Royal Palm. Upon his passing in 1928, the hotel was still reeling from the 1926 Hurricane and it was losing guests and profitability to newer and more modern hotels. The final blow was the construction project for the new SE Second Avenue Bridge. This bridge would connect downtown Miami with Brickell Avenue on the south side of the Miami River. The project required the demolition of the west wing of the Royal Palm Hotel. The Florida East Coast Hotel Company was concerned that opening the hotel during the bridge construction would deter any hotel guests. Mayor E.G. Sewell, who was part of the ground breaking ceremony 34 years earlier, pleaded with the FEC Hotel company to continue to open the Royal Palm Hotel. Ultimately, it was Mayor Sewell’s hope that the Florida East Coast Hotel Company would erect a more modern hotel on this site, similar to the Breakers. This never happened. By 1930, the Royal Palm had been vacant for several years and it was condemned by the city. Compounding the damage caused by the 1926 Hurricane, the hotel became infested with termites. Although only 33 years old, it was dismantled and burned section by section on the very ground it once stood proudly. After demolition, all that was left was the memory of what it once was. Since the dismantling of the Royal Palm Hotel in 1930, there have been many buildings that have gone up and come down in Miami. Over time, as Miami’s skyline continues to evolve, there will be many more that will come and go. However, none will be as iconic as the Royal Palm. The beginning of Miami as a city certainly can be considered a majestic time. There is nothing that represented that time better than the image of the beautiful and expansive Royal Palm Hotel. The land on which the hotel resided spent a lot of time as a parking lot through the second half of the 20th century. It is now the location of the Met 3 building, which many locals now know as the location of the Whole Foods. 10 Comments on "Miami’s First Luxury Hotel"
Check out the photo gallery of the Royal Palm Hotel at: http://facebook.com/miami.history1896. I’ve been to Miami once in my life, for a conference a few months ago. I was set up at the Epic Hotel, which appears to be directly to the east of the 2nd Avenue Bridge, i.e. exactly where the Royal Palm Hotel once stood. Am I missing anything? I ran across that bridge a few times when I was going on runs, and went a ways down Brickell. At that point I didn’t know the history of any of it. Also want to throw in a quick offer — I’ve got an American history website (link in the “website” box), and it would be awesome if you wanted to do anything Miami related on there. I’m looking for a variety of viewpoints. This was a great blog. I moved here in 1996 just as Miami was celebrating its 100 birthday. Just in the past 18 years the area that is described in this article has gone through massive changes. I still remember going for a drink at the Dupont Plaza Hotel where the Epic Hotel sits now, it really felt like you were stepping back in time to the 1950’s. There are many people who hate all the construction going on in this area today. The common complain is that it is only for the rich, but as you can see even more than a century ago, Miami has always attracted the wealthy, and it is because of this allure that our city keeps growing. Three years from now when Brickell City Center, Riverwalk, All Aboard Florida Grand Central Station, and Miami World Center are all completed, Miami will continue to be what it was 118 years ago, a true Magic City. Great blog. Love Miami’s history. A miami native, i would love history on “the roads”. Special neighborhood designed by mary brickell before her passing. Very nice blog, thanks for sharing about this. I am very thankful that I am one of the luckiest who read this. I am also an owner of a website that can help you to about your problem in pesticides. Try to visit our site, thank you.